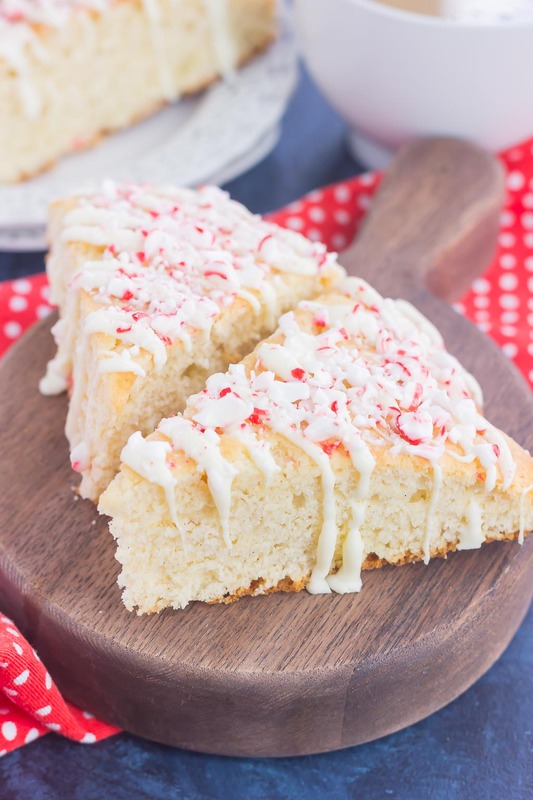 These White Chocolate Peppermint Scones are light, fluffy and bursting with flavor. 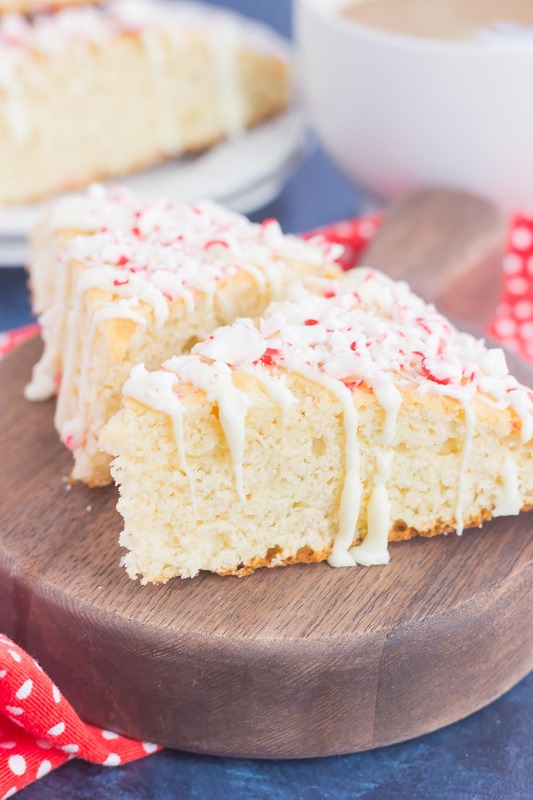 Filled with hints of peppermint and topped with a white chocolate and peppermint glaze, these soft scones make the best holiday breakfast or dessert! Are you into the holiday spirit yet? I sure am and I’m proud of it! It’s my favorite season of the year and it always seems to go by way too quickly. One minute it’s Thanksgiving and the next, we’re back to January, so I’m trying to savor the moments while I can. Christmas movies have been on repeat, as well as all of those holiday songs. Whenever I’m testing a recipe in the kitchen or shooting a new dish, Christmas music is a must for me. Speaking of music, do you have any favorite holiday songs that you’d like to share? I usually just go through Spotify and flip through their holiday music, but I’d love to know if you have a favorite song or playlist! Besides the music, movies, and decorations, nothing gets me in the mood more than some holiday flavors. I’m looking at you, peppermint! 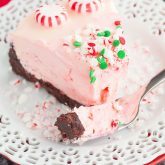 If you’re not a big fan of peppermint, not to worry, I have some other recipes coming up soon without it. But, if you’re a peppermint lover like I am, then I’ve got some tasty ones headed your way. Starting with these scones! If you’re a fan of soft and fluffy scones, you’ll fall in love with this recipe. No dry and crumbly ones here, my friends. I know scones may sound intimidating to make, but trust me, these peppermint scones couldn’t get any easier. The hardest part is cutting in the cold butter, which is really not that bad. Want to know my secret? Freeze the butter and then grate using the largest holes of a cheese grater. Then mix into the flour mixture and you’re good to go! I think this method is easier than using a pastry cutter or butter knives. The peppermint flavoring comes from a hint of peppermint extract. It’s important not to add too much, as a little goes a long way. 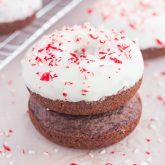 You could also add some crushed candy canes to the dough, but I chose to add in on top for that pretty, finishing touch. 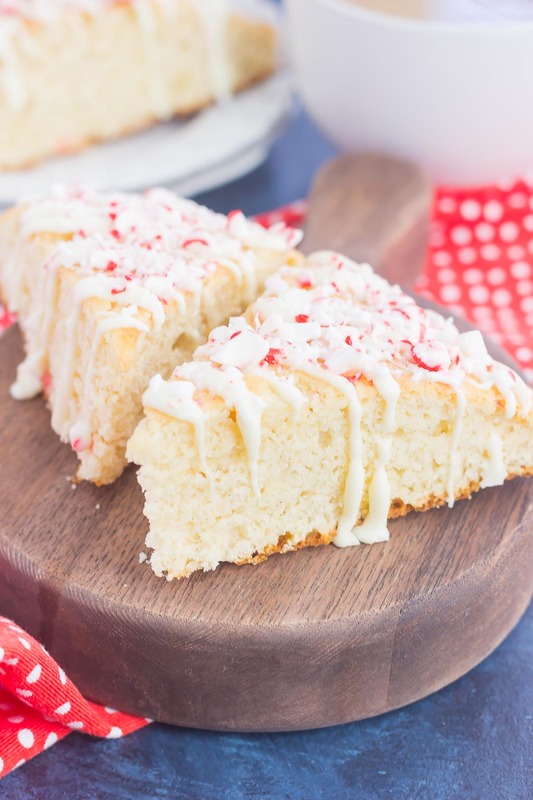 Trust me when I say that these white chocolate scones are pretty the best when it comes to a holiday dessert. I mean, what could be better than a treat that counts as both breakfast and dessert? Serve these soft and fluffy scones with coffee for breakfast or enjoy after dinner for that perfect treat. 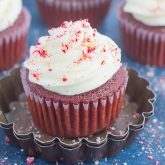 And if you’ve got a calendar full of parties and get-togethers this season, whip these cuties up! I guarantee these will impress those hungry party-goers, friends! 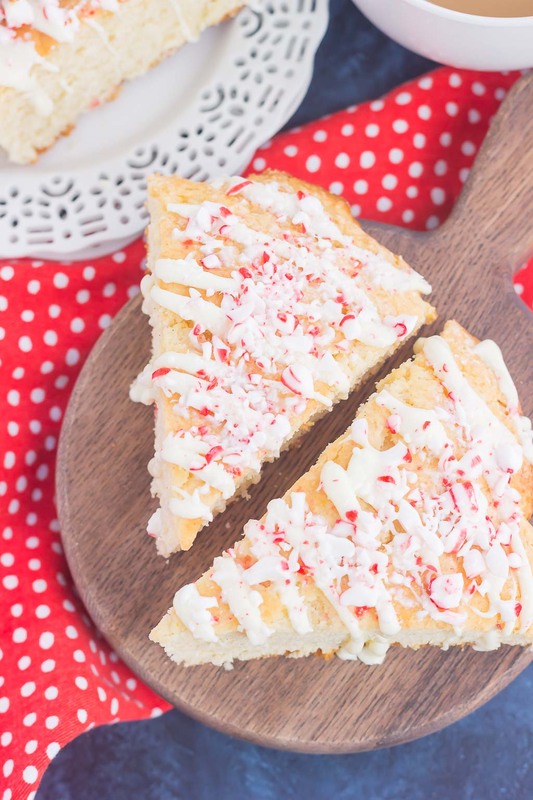 Looking for more peppermint treats? I’ve got you covered! Preheat oven to 400F. Line a large baking pan with parchment paper. Set aside. In a medium bowl, combine the flour, sugar, baking powder, and salt. Set aside. Cut in butter with using a pastry cutter or two forks until mixture resembles coarse sand. **Alternatively (and a much easier method), freeze one stick of butter for about 30 minutes. Remove from freezer and grate butter using the largest holes on a cheese grater. Add to flour mixture and stir to combine. Set aside. 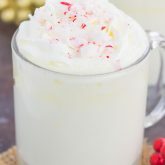 In a medium bowl, whisk egg, peppermint extract, vanilla extract, and milk. Make a well in the dry ingredients and pour wet ingredients in. Fold until just combined. Add more flour if dough is too sticky. If dough is too dry, add 1-2 tablespoons of milk. Turn dough out onto prepared pan and shape into a 7-inch disk. Cut dough into 8 wedges, but do not separate pieces. Bake for 16-8 minutes, or until scones are golden brown. Let cool for 10 minutes on pan, then move to a wire rack to cool completely. To make the glaze, in a small bowl, microwave white chocolate wafers (or chips) on medium power until wafers are melted and smooth, stirring ever 15 seconds so not to burn. Remove from microwave and drizzle or spread onto cooled scones. Sprinkle with crushed candy canes. 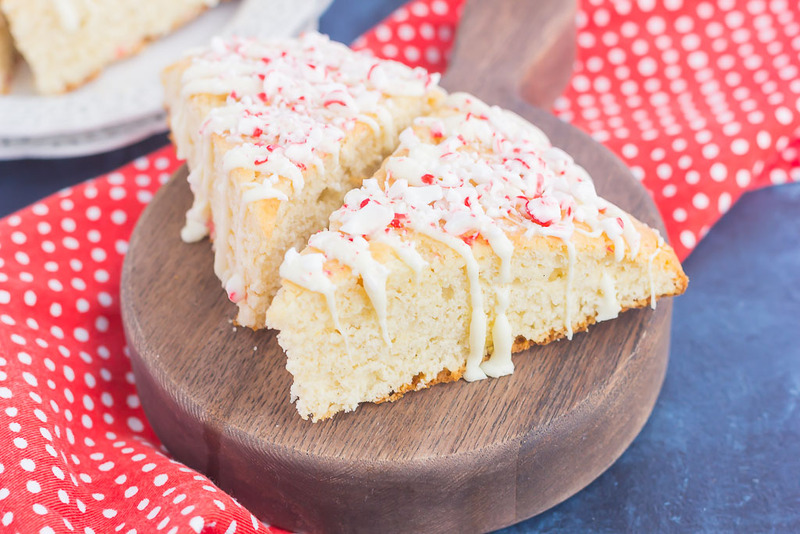 White chocolate and peppermint seriously sounds like the DREAMIEST combo in these gorgeous scones!! These would be so perfect for holiday brunch! Thanks for the sweet comment, Sarah!